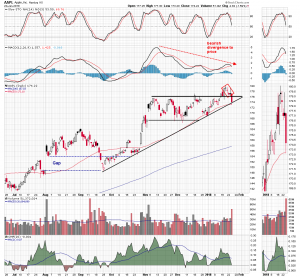 We have been highlighting the candle action on the Apple (AAPL) chart over the previous four days. An unusual series of doji candles formed on the daily chart which suggested a potential reversal, and there was a move to the downside in Wednesday’s session. Apple shares were down nearly 1.6% on Wednesday returning to their 50 day moving average and an uptrend line drawn off the lows of the last four months. The integrity of this intersection of support at the $173 level could determine the intermediate term direction of the stock price. As we noted in the previous article ” Apple Stock Positioned For A Potentially Deep Pullback,” the overbought condition illustrated by the diversion and then reversion of the blended 10 week and 40 week moving averages, has preceded deep corrective pullbacks in the stock price. Any further downside will turn the blended average below its signal line. 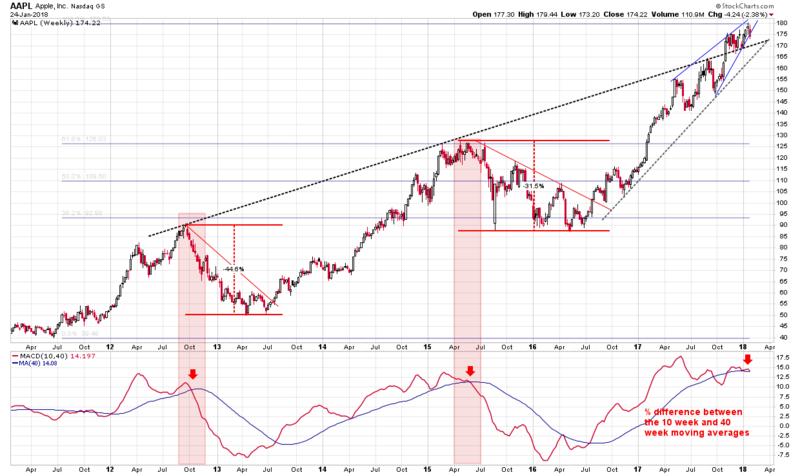 This is the precondition to the dire pullback scenario. The depth or duration of a pullback, if one does occur, is speculation at this point, but a break below the 50 day moving average is something Apple longs should watch very carefully.